Confession time: over the last week, the word count for my novel has barely budged. In fact, it’s gone down slightly. That was partly because the portable keyboard I bought for my holiday was a bit of a disaster. It wasn't mentioned in the reviews on Amazon, but once it's unfolded there's no way to lock it flat, and the hinge has an unfortunate tendency to bend backwards. As a result you can only use it when leaning against something flat and solid like a floor, a hardback book or an actual laptop, which does rather defeat the point. That wasn't the only problem, though – my productivity also suffered because my various plot threads were getting so tangled I couldn’t carry on without unknotting them first. Straightening them out was enormously satisfying, but it involved chopping out some dialogue and a whole scene I was particularly fond of. Looking at the story as a whole and the characters involved, those parts just didn’t sit right. As the old saying goes, sometimes you have to kill your darlings (or cut and paste them into a purgatory called ‘darlings.txt’ and pine for them). Fun as it was, I don’t want to repeat that process any time soon, so once again I’ve turned to tech. Specifically, LibreOffice Calc – the finest free alternative to Microsoft Excel. After all, who doesn’t love a nice, juicy spreadsheet? Anyone? Hello? There are many more interesting ways to plot a novel. 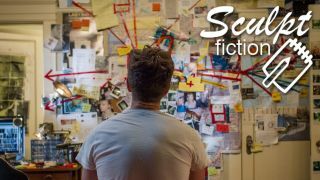 I could have used “complete writing studio” Scrivener, or stuck pictures of my characters on a corkboard connected by pieces of colored string like a TV detective (or Spider-Man, as depicted above). However, that would require time and wall space that I just don’t have. Calc it was. Not only did this exercise help me map out the key events in each chapter, the locations, the characters and the conflict, it also made me notice just how much tea my main character was drinking – like some kind of caffeinated James Bond. It was in danger of rivalling the number of sandwiches consumed by Mikael Blomkvist and Lisbeth Salander throughout The Girl with the Dragon Tattoo. Now it’s done, I’m ready to jump back into FocusWriter with renewed enthusiasm. I know I keep banging on about it, but it really is a brilliant little program for creative writing. It’s no use whatsoever for editing (for that, you need a full-fat word processor like LibreOffice Writer), but when you want to let your imagine loose it really is brilliant. There’s nothing between the blank page and the weird little tea-stained world you’ve built inside your head. Pass the biscuits.